Sure. Technically, that’s true. But it’s also a matter of principle. I thought this way in 2012 and didn’t even bother with NaNo. I think I’m more comfortable with that than if I had tried it and failed. But I’m still a little disappointed to see that gap in my NaNo history. This year I went in knowing I wasn’t that enthusiastic about the project but I wanted to finish it anyway. And you know what? I did. I did it anyway. Now, The Face Of The World (my 2014 project) is still only kind of a meh idea. The execution is even worse. Granted, it’s a (partial) first draft, so I’m truly okay with it sucking quite a bit. It’s fine. There is, as with my other two NaNo projects, a germ of something in there. Maybe it’s something I can revisit later. Or, maybe I won’t. Each of these things that I do is a trial. An extended experiment in compressed-time content generation. I’ve learned something from each one. From 2011 I learned that having no guide whatsoever is disastrous to a project. I discovery wrote the whole thing and drove it into a corner I had no means of escaping. It still sits incomplete. From 2013 I learned that having a ton of world building but no plot roadmap makes for a meandering journey, one that creates its own plot holes the way bacteria creates the holes in swiss cheese. From this year I learned that plot outlines and weaving story elements together can help create something out of (basically) nothing. And that enthusiasm is not mandatory for production. However, I also hypothesize that clear roadmaps, detailed world building and element weaving plus enthusiasm could be the formula that allows me to create my best work yet. Something else I suspect—but will have to evaluate a bit more after some time passes and I have a bit of distance from this thing—is that an area I need to improve is my base prose styling on first drafts. I know, I know, first drafts don’t have to be great. But part of why novels elude me is that the revisioning process for them is so long and tedious I get sort of drowsy just thinking about it. If my writing on longer pieces was better at the outset, rather than needing five to eight passes just to get something I had a degree of confidence with, the revisions might not be so onerous. Less painful editing might mean more interest in working with longer formats. And while I’m still devoted to short forms, at some point the goal of having a book published is going to have to be addressed. Might as well do now what I’ll need to have done before I shift my focus there. You know, in like five to eight years. So, the bottom line is: I did it. 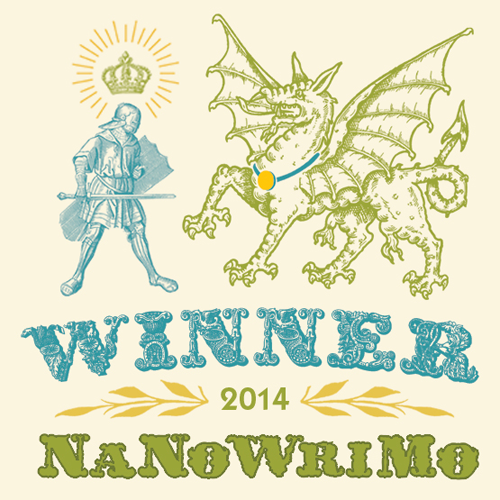 I finished NaNoWriMo 2014. I’m proud of myself, I’m grateful to my family for their patience, and I’m ready to jump back into these projects that have been waiting on the back burner for the past thirty days. Interlude over, it’s onward and upward from here. At least, until next year.